For Mark Cavendish, Team Sky is the long-distance relationship that has just not worked out. For Team Sky, Cavendish just does not work out for long distances. They tried, it did not click, nobody got hurt, and they can all look forward to seeing each other on the starting line next season without anger, embarrassment or too many regrets. As divorces go, it is hard to beat in the amicability stakes. But that will not stop some fans from wondering why it did not work and who was to blame, because somebody must be to blame, right? In September 2011, wins gold medal at the Road World Championships and joins Team Sky a month later. The truth, however, is less exciting than the conspiracy theorists would like: Cavendish and Team Sky might have looked great together, but they should have stayed friends, not partners. Of course, with the benefit of 12 months' worth of what Team Sky boss Dave Brailsford might call data (but the rest of us would recognise as hindsight), it is easy to say that now. The picture was not so clear when Cavendish signed his three-year deal in October 2011, though. Back then, with Cavendish's World Championship victory still vivid in the memory, everything seemed possible. The Isle of Man-born superstar had just backed up his green jersey-winning performance at the Tour de France, the first British rider to achieve that, with this country's first triumph in the biggest one-day race on the calendar for 46 years. Riders perform in national colours at the Worlds, so "Cav" was wearing a GB jersey, with GB team-mates, following a plan devised by GB coaches. But that victory was arguably the high point of the Cavendish-Team Sky partnership. Born of a dream to transfer Britain's track prowess to the road, based at the National Cycling Centre in Manchester, and bankrolled by a big British brand, Team Sky is our flag-carrier in the cosmopolitan world of professional racing. Brailsford, for example, has not only spent the last four years developing Team Sky, he has also run the Olympic cycling team: BMX, mountain bikes, para-cycling, road, track, the lot. 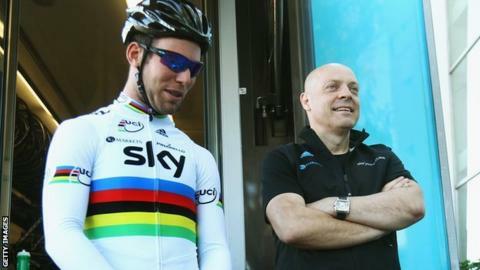 But the cross-pollination between Teams GB and Sky goes beyond Brailsford. Coaches, kit, science and, most importantly, riders have flowed between the programmes to wonderful effect - six of Cavendish's seven team-mates at the Worlds were from Team Sky. Cavendish was actually in the strange position of being both the poster boy for this professional/Olympic connection, and the "one who got away". When Brailsford went to BSkyB in 2008 to ask for the millions he would need to develop a winning team, Cavendish was his best case study. But "the Manx Missile" had exploded onto the scene too early. Already a track world champion, Cavendish moved to the road in 2005 with the formidable T-Mobile Team's development squad. With no natural home for him here, he was forced to do what dozens of talented Brits had done before and join a continental team. Over the next six years, that team would be transformed from a German outfit focused on winning the Tour, to a multi-national ensemble dedicated to one-day victories and stage triumphs. Sponsors came and went but the team kept winning, and the image of Cavendish rolling through the line, arms outstretched, became its calling card… right up until the moment the last sponsor, Taiwanese phone company HTC, put the brakes on. Some pundits suggested Team Sky making eyes at Cavendish during the contract renegotiations did not help, but the truth is that HTC-Highroad, to give it its final name, had been struggling to hold on to its riders for some time, and it was only his prolific hit-rate that kept the show on the road for so long. What is equally true, however, is that by 2011, the lure of a "return home" had become as irresistible to Cavendish as the Death Star's Tractor Beam was to the Millennium Falcon. Any debate about how a sprinter might be integrated into a team with the stated ambition of winning the Tour by 2014 was forgotten in the moment. So often was the twin goal of green and yellow jerseys repeated, it became a mantra. Team Sky, to be fair, were coming off a breakthrough season, Cav was Cav, and that day in Denmark proved what could happen when you put them together. The fact that no team had managed the green/yellow double since HTC-Highroad's ancestor Team Telekom in 1997 was barely mentioned. But, as Cavendish so often demonstrates, timing is all in sport. Those breakthroughs - particularly Chris Froome and Bradley Wiggins finishing second and third at the year's final grand tour, the Vuelta - changed the team's expectations and focus. A fortnight after Cavendish signed his contract, his new team's priorities crystalised with the announcement of a 2012 Tour de France route that looked made for Wiggins. Suddenly, Brailsford's "British winner within five years" ambition did not look so farfetched, but only if his inexperienced team concentrated their efforts. Any distraction with secondary targets would alert the cycling gods to hubris. Cavendish's 2011 finished in glorious fashion with a richly deserved win at the BBC Sports Personality of the Year show, but his prospects going forward were ever so subtly being reduced. First, a backdated doping ban removed Alberto Contador from the Tour start list, adding to the sense that this could be Wiggins' year, and then Team Sky's "A Team" started to deliver on those gruelling "altitude camps" in Tenerife. Wiggins went from hopeful to favourite with three victories in four months. They had found a formula - as many big diesels as they could muster to reel in breakaways, ward off attacks and set up "Froomey and Wiggo" for the final assault - and it was difficult to see where the highly-tuned Cavendish and his pit crew would fit in. For his part, Cavendish made a steady start to the season, winning stages in Qatar and Italy, but he probably did not win as many races he would have liked, and he certainly crashed more times than he liked, or was used to. This would become a theme for his year and perhaps the only source of tension between him and Team Sky. Cavendish's point was that he had never expected to have a platoon of riders working hard to set him up for bunch sprints, but he had expected some protection for his front wheel as anxious rivals tried to baulk his burst for the line. A huge crash at the Giro, was followed by another at the Tour: the 27-year-old was lucky to ride away from both, but the experiences served to remind him how isolated he was now with his team keeping most of its riders safely out of the harm's way. With little luck or support, Cavendish was unable to mount a defence of his green jersey. He would win three stages to take his career total to 23, but the first of those was a textbook example of opportunistic brilliance, and the last two came when Wiggins' hold on yellow looked secure. For any other rider, three stages and 15 victories in total for the year would be a fine return. But for the man French sports newspaper L'Equipe's readers voted as the best sprinter in Tour history, it is average. Add to that the disappointment of not repeating the GB/Sky Copenhagen trick at London 2012 and you have a campaign that falls below his high standards. Television footage of the world champion going back to the team car to collect water bottles for Wiggins' workhorses was another sight that raised eyebrows, although it was not something he complained about, which is to his credit. That fact also goes a long way to explaining why he kept quiet until the eve of his final outing for Team Sky, the Tour of Britain - Cavendish appreciated being part of a historic year for British cycling, and he enjoyed sharing his friend's triumph; he just does not want to do it again. And neither should British cycling fans. His is a talent that deserves the best possible home. Under different circumstances, that home could have been Team Sky, but the circumstances changed. The good news is that those circumstances changed for the better, Britain now has a grand tour winner. The even better news, is that all parties realised this and Cavendish can get back to winning green jerseys for Omega Pharma- Quickstep, another multi-national ensemble dedicated to putting him in the right place at the right time - which is crossing the line, with arms outstretched.